Dear Esther Artist Mulls "S.T.A.L.K.E.R. Without Weapons"
Robert Briscoe of Dear Esther fame has a pretty cool idea for an open-world exploration game. 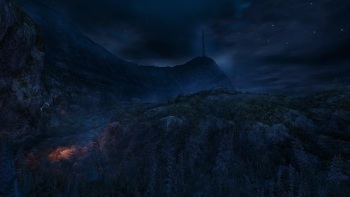 Dear Esther is a game of remarkable beauty. Much of the credit for that must go to artist and environment designer Robert Briscoe, who came to the project following a stint as a level artist on Mirror's Edge. He described the attraction of Dear Esther as "being able to strip away this other gameplay, this traditional gameplay, and just have environment exploration being the main gameplay mechanic," but even so, it was still a very linear experience, essentially a walk along a path. But the idea he's kicking around right now sounds a little broader in scope. "I kind of quite fancied the idea of doing something on my own, something that's just completely of my own creation... I've always had this idea in my head, it's kind of like an open world, S.T.A.L.K.E.R.-ish type game, but without weapons, and this horror aspect to it. I've obviously never had the opportunity to do it, the scope of it is huge compared to something like Dear Esther, even though Dear Esther ended up being much larger than I thought originally," he said in an interview with Joe Martin's Unlimited Hyperbole podcast. "Can't even believe I'm contemplating doing this kind of open world type of thing, I mean, it's just so unreal for one person to do. And this is the whole thing, I want to see if just one person could create a game on their own, to a degree that's probably not been done before." Briscoe is just kicking around ideas and looking at engines at this point, but said that Dear Esther has left him with the means to support himself while he works on the project "for the next four years" if he wants to. As someone who would go absolutely nuts for an open-world S.T.A.L.K.E.R.-style exploration-horror game tinged with Briscoe's artistic sense, I think that's very good news indeed.